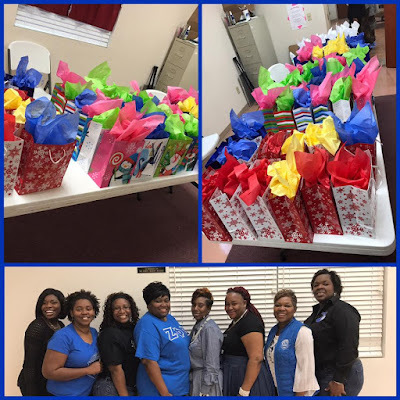 Zeta Phi Beta Sorority, Inc., Omicron Alpha Zeta Chapter in Partnership with Bethesda Missionary Baptist Church co-hosted a Christmas Program for Approved Workmen Are Not Ashamed (AWANA) and Angel Tree® youth. The youth performed various fun-filled songs, speeches, and a skit and enjoyed a generous Christmas Fellowship Dinner with all the trimmings! Omicron Alpha Zeta donated 70 gifts to the youth comprised of hats, gloves, and scarves. AWANA is a youth ministry of Bethesda Missionary Baptist Church that is dedicated to the conviction that the church’s most fruitful mission is reaching children. 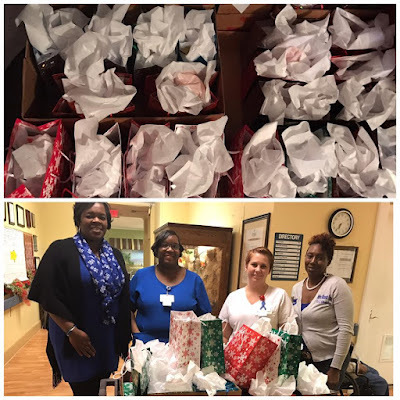 Angel Tree® is a program of the Prison Fellowship that reaches out to the children of inmates and their families with the love of Christ. Also, the Sorors of Omicron Alpha Zeta provided gifts to 55 residents of its adopted facility, the Lillian Carter Rehabilitation Center. We provided the Activities Center with large puzzle books, socks, slippers, cards, and games. The residents were very excited!